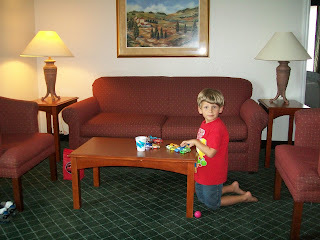 On our mini vacation to San Antonio, we were fortunate enough to stay in a suite at La Quinta. It had a separate bedroom, which was very handy when it was time for Brady to take a nap or the boys to go to bed. And the living room area was huge with lots of room for the boys to play. We loved it!! Dawson playing with some of his cars. 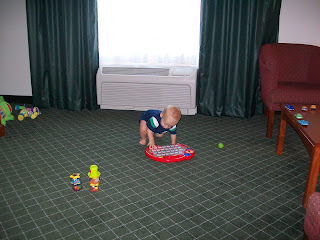 Brady playing with some toys on the floor. Brady really liked this light-up ABC board. 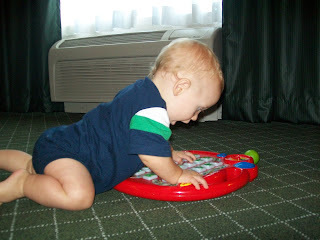 He especially liked sliding around the room on it. 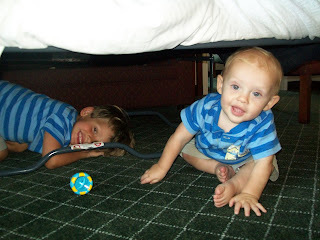 Being silly under the sofa bed.